French riot police clashed with Russian and English fans in Marseille during Euro 2016. 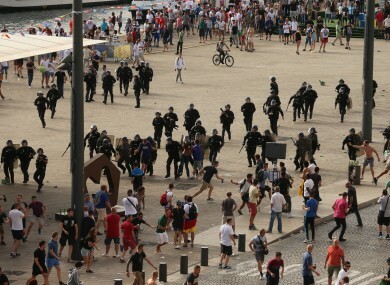 A TOP ORGANISER of next year’s World Cup has dismissed the threat of hooliganism as “overblown” and “fake” despite concerns after Russian fans went on the rampage at Euro 2016. Alexander Djordjadze, deputy CEO of the Russia 2018 organising committee, gave assurances that fans would be safe at next year’s tournament and blamed negative media coverage for stirring up controversy. Since well-prepared Russian hooligans struck at Euro 2016 in France, one Russian legislator has called for hooliganism to be made legal and turned into a spectator sport. A BBC documentary also filmed a leading Russian hooligan warning fans to expect a “festival of violence” next year, when Russia hosts the World Cup for the first time. But Djordjadze, speaking at the World Football Forum in Changsha, China, said hooliganism was “not a problem” for the World Cup. “We don’t see any problems with the hooligans. Hooliganism is more endemic for the club football,” Djordjadze told AFP. “The World Cup and Confederations Cup have slightly different population groups coming so we don’t see hooliganism as a security threat. Djordjadze said South Africa and Brazil, the two last World Cup hosts in 2010 and 2014, also faced questions over security but ultimately hosted successful World Cups. Of course it’s overblown,” he said, when asked about the threat of fan violence. “It’s overblown by press in certain countries. Despite playing down the danger of hooliganism, Djordjadze said the security presence would be high in World Cup host cities, and that Russia would make sure known offenders cannot enter stadiums. “Measures are taken by our security agencies. They know the people who are on the hooligans’ list. They are forbidden to come to the stadiums, similar to the UK practices. So we don’t see it’s a problem,” he said. Djordjadze added that preparations for the World Cup were on track, with all stadiums expected to be completed this year and ticket sales starting in November. The tournament will be played between 14 June and 15 July next year, across 11 Russian cities. Russia is also hosting the Confederations Cup, the traditional warm-up tournament, next month. The Republic of Ireland currently sit joint-top of their group at the halfway point of the qualifying campaign. Email “Threat of football hooligans at next year's World Cup 'fake' and 'overblown'”. Feedback on “Threat of football hooligans at next year's World Cup 'fake' and 'overblown'”.